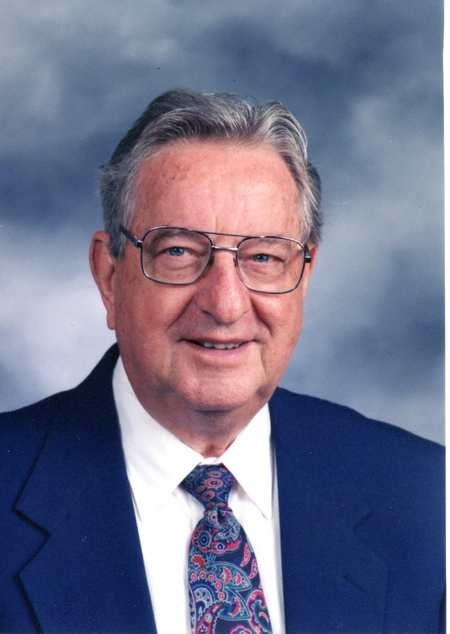 Long-time Grace Brethren pastor, Dr. John Mayes, died Saturday, February 9, 2013, in Longview, Tex. He led Grace Brethren churches in California, Washington, and Texas before retiring in the 1990s. His obituary appears below. Funeral services for the Reverend Dr. John Wallace Mayes, 87, of Longview, Tex., will be held at 10 a.m. Tuesday, February 12, 2013, at Rader Funeral Home Chapel in Longview. Burial will follow in Rosewood Park Cemetery. There will be a time of visitation at the funeral home Monday evening, February 11, 2013 from 6pm-8pm. Dr. Mayes died Saturday, February 09, 2013, at his residence in Longview. Dr. Mayes was born September 30, 1925 in Lanark, Illinois. He attended Grace Seminary from 1950-1952 and received his Doctorate from California Graduate School of Theology. Following pastorates in Paramount, California; Long Beach, California; Sunnyside, Washington and Whittier, California, he moved to Longview to become pastor of the Longview Grace Brethren Church in 1981. He was pastor there for 16 years. During that time he also was a founder of Grace Christian School and Maranatha Christian High School in Longview. Dr. Mayes also participated in many other ministries including being a long-time board member of the Grace Brethren Home Missions Board, a board member of Missionary Tech Team of Longview, Texas, National President of the Fellowship of Grace Brethren Churches Ministerium, and National Moderator of the Fellowship of Grace Brethren Churches. He was awarded a Lifetime Achievement Award by the Fellowship of Grace Brethren Churches in 2000. During his 47 years in the ministry, he was much-loved by many people for his counsel and faithful teaching of the Bible. Dr. Mayes is survived by his four children, Richard Mayes and his wife, Sandy, Sharon Newlin and her husband, Stuart, Dr. Annie Olson and her husband, Ken, all of Longview, and Joy Dean and her husband, Steve of Indianapolis, Indiana; 17 grandchildren; and 21 great grandchildren. He was preceded in death by his wife of 58 years, Marjorie Florence Mayes in 2007. Memorial contributions may be made for a memorial project to Longview Grace Brethren Church, 800 Doyle St., Longview, TX 75601. Pastor Mayes was such an energetic pastor that truly loved the Lord. He was used by the LORD to make an indelible impact in my life, through his life and through sound doctrine from the pulpit, even though I was only a member of the congregation for a year. I will always (and my wife Janet) cherish and remember our time in Longview. I also thank the congregation of Longview who supported us for that year. It's hard to believe that over 30 years have passed since we were last there.